NASA's New Horizons mission has not yet discovered any moons around the object Ultima Thule, but team members are still looking. The most distant celestial object ever explored may well have moons, and astronomers are trying hard to find them. In the wee hours of Jan. 1, NASA's New Horizons spacecraft zoomed past the small, frigid object Ultima Thule, which lies more than 4 billion miles (6.4 billion kilometers) from Earth. The probe has beamed home just a tiny fraction of its flyby data so far, but mission team members are already starting to get the goods on the far-flung rock. 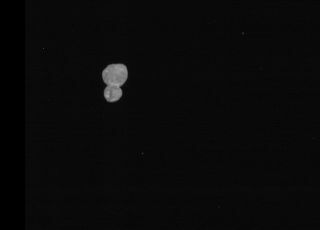 Modeling work suggests that the two constituent bodies, dubbed "Ultima" and "Thule," likely completed one rotation every 3 or 4 hours around the time when they hooked up, mission team members said. But New Horizons' observations show that the present-day Ultima Thule takes about 15 hours to make a full spin. "So, how did they slow down? Well, the best way to understand that is if there were another moon, or two or three, orbiting this system," Mark Showalter, a New Horizons co-investigator from the SETI (Search for Extraterrestrial Intelligence) Institute in Mountain View, California, said during a news conference Thursday (Jan. 3). "Essentially, what those moons would do is put the brakes on the two bodies in the middle — slow them down" by carrying away the duo's angular momentum, he added. So the hunt for Ultima Thule satellites — which began in earnest a while back, when the mission team was investigating potential hazards that could complicate the epic New Year's Day flyby — is hardly a lark. The mission team has ruled out the existence of any sizable moons at least 500 miles (800 km) away from Ultima Thule, or within 100 miles (160 km) of the object, Showalter said. But that middle zone is a big question mark and will remain so until late January, when New Horizons beams home observations covering the region. And, crucially, that in-between zone is the most likely place for satellites to exist in the system, Showalter said. He and his colleagues are really hoping they turn up at least one moon, for such a find would help them tease out key details about Ultima Thule that they'll be hard-pressed to determine any other way. "Any moon at all, on any orbit at all, will tell us the mass and the density to pretty decent usable precision," Showalter said. "And so we’re very, very excited about that prospect." Even if the search ultimately comes up empty, that doesn't mean Ultima Thule — which is officially known as 2014 MU69 — never hosted moons, he added. As "braking" satellites carry away angular momentum from their systems' central bodies, these moons move farther and farther out into space. So, it's possible that Ultima Thule once had such satellites, but these moons moved so far away that they were eventually lost. The $700 million New Horizons mission launched in January 2006, tasked with returning the first up-close images of Pluto. The mission aced this goal when it cruised past the dwarf planet in July 2015, revealing Pluto to be a world of stunning beauty and geological diversity. The Ultima Thule flyby is the centerpiece of New Horizons' extended mission, which runs through 2021. The spacecraft has enough fuel and power, and is in good enough health, to potentially fly past a third object, if NASA grants another mission extension, team members have said.